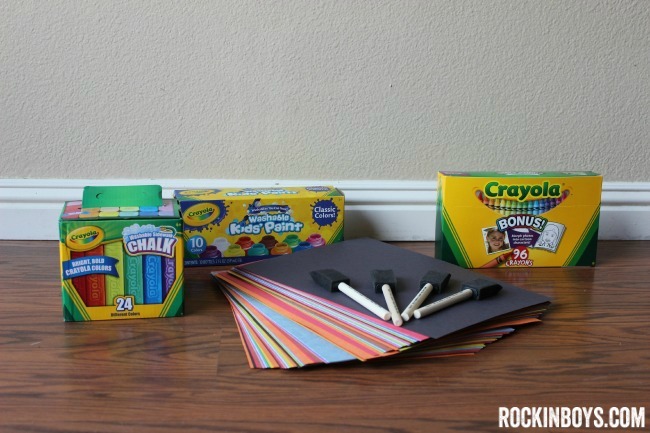 This fun Super Duper Secret Message Painting crayon resist activity is part a #ColorfulCreations compensated campaign featuring Crayola and hosted by the social shopper media company #CollectiveBias. 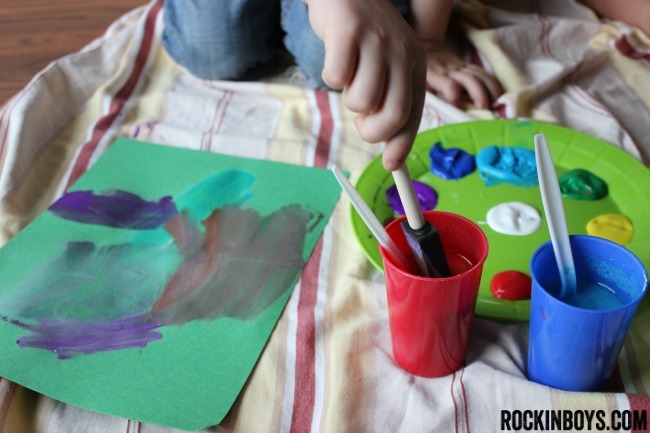 We were asked to come up with a fun rainy day craft using three specific products. This post features our own ideas and opinions. We are lucky to live in Southern California where the weather is almost always perfect. We spend a lot of time outside doing what boys love to do – playing in the dirt. Every now and then we get a rainy day or a rainy weekend and although it limits our activities, I do love taking a break from being out and about. 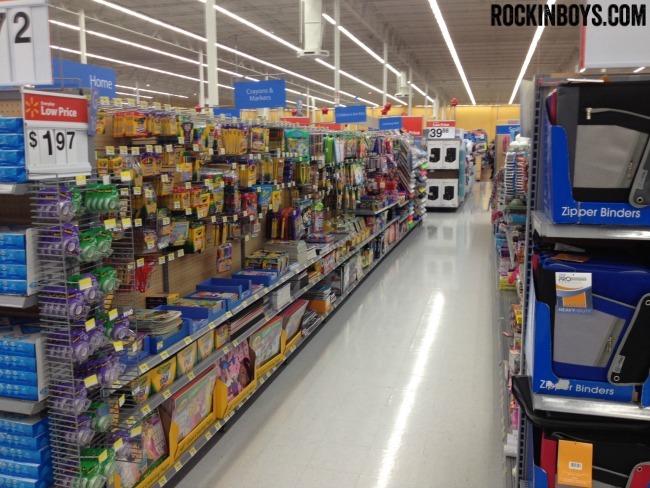 After three wetter-than-usual days my craft supplies were dwindling, so a trip to Walmart was in order. 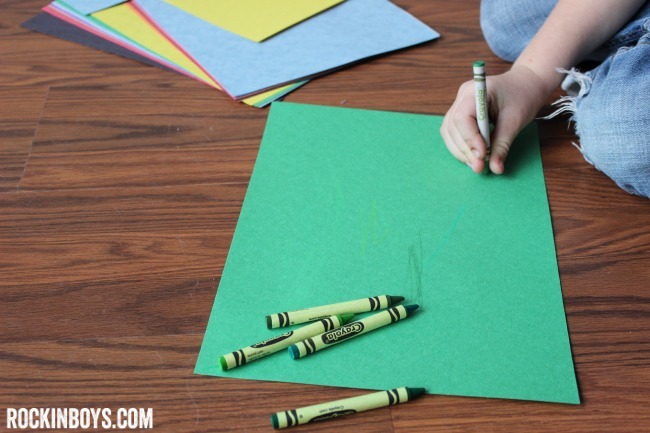 I grabbed crayons, sidewalk chalk, washable paint, a pack of construction paper and some paint brushes and headed home to put together an activity for the boys to do. It was a fun challenge to think of something that could incorporate all three Crayola products. They absolutely love painting – and it’s a great creative outlet – but they also needed an outlet for some of their built up energy. That’s where the sidewalk chalk comes in. No, I wasn’t going to send them outside in the rain with them. I had a very different idea. 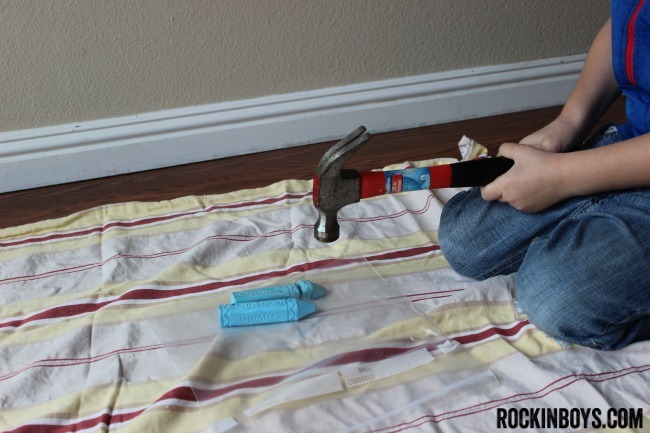 What better way to get some energy out than with a hammer? We made some chalk paint, which is a great way to introduce a different medium into an art project. The boys got a kick out of hammering, and they also enjoyed mixing as well. 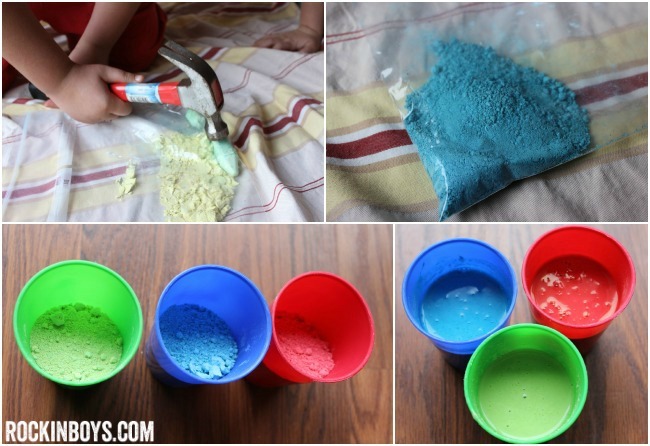 For the chalk paint, crush up two similarly-colored pieces of Crayola sidewalk chalk into a powder. Add a 1/2 cup of water and mix well. It’s okay if it’s a little lumpy, it adds a fun texture. We went with three colors of chalk paint. You can do more or less. The next step is to find a crayon that matches your paper as closely as possible so that you can hardly see whatever you write or draw. To do this we just simply tested a bunch of different crayons until we found the best one. It’s a great way to teach colors to younger kids as you have them picking out the crayons that they think will match the paper. After we found the crayons we needed, the boys drew pictures on their paper. 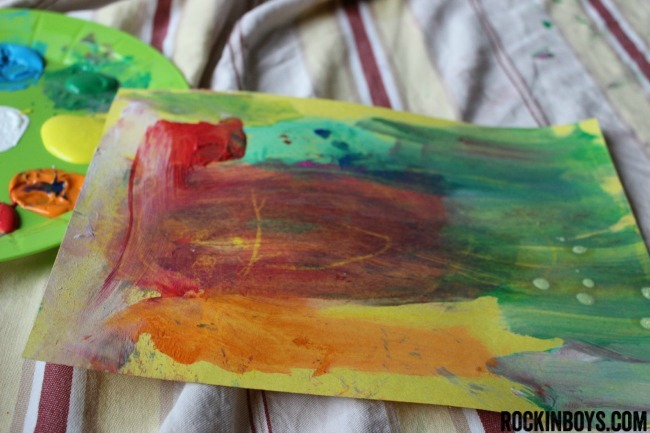 It is important to press down very hard with the crayon in order for it to show up when you paint over it. There’s no rhyme and reason to this project. 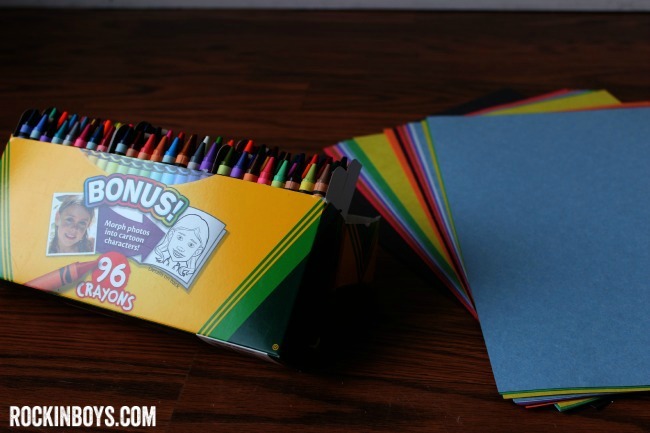 Just pick a color or two, or all ten, and paint all over your paper. You should be able to see your crayon peeking out from underneath, hopefully. 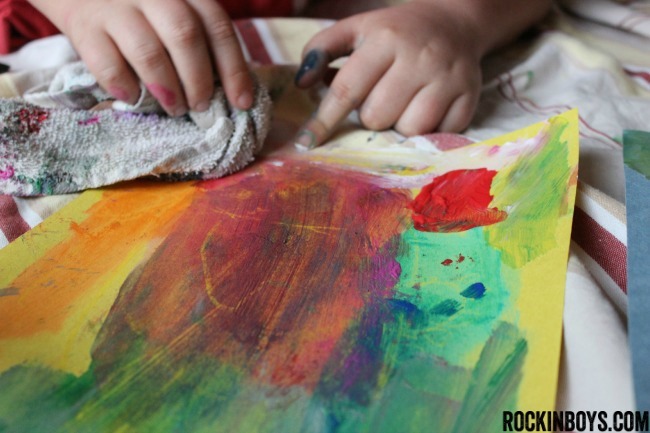 It works best with a very thin layer of the washable paints. I found that wetting the sponge paintbrush first helped a ton. Too much paint? Just wipe a little off. Can you see the drawing of a man beneath the paint? We had a fun time making Super Duper Top Secret Message Paintings using our Crayola products. What would you make with these three products?